Escape the urban bustle at Aurinkolahti Beach and Korkeasaari Zoo. Your inner history buff will appreciate Sea Fortress Suomenlinna and Rock Church. 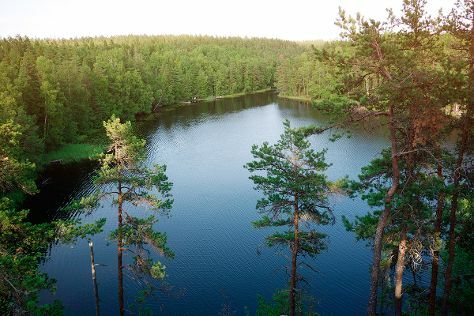 Venture out of the city with trips to Valkmusa National Park (in Siltakyla), Nuuksio National Park (in Espoo) and Beach Mansikkalahti (in Kotka). And it doesn't end there: kick back and relax at Hietaranta Beach, cruise along King's Road, take in the architecture and atmosphere at Helsinki Cathedral, and take in the spiritual surroundings of Uspenskin Cathedral (Uspenskin Katedraali). If you are flying in from France, the closest major airport is Helsinki Vantaa Airport. In November, daily temperatures in Helsinki can reach 5°C, while at night they dip to 0°C. Finish up your sightseeing early on the 10th (Sat) so you can travel back home.